Solid EQ matching, though the 'defiltering' process is better on speech than music, where it's as likely to hurt as it is to help. Easy to use. Clear filter displays. Helps to make speech more intelligible. Store your own user profiles. Results are hit and miss. Can't refine the Filter Curve manually. Analysis doesn't consider musicality. Automatic EQ has been with us for some time now, so you'd expect it to be improving with age. 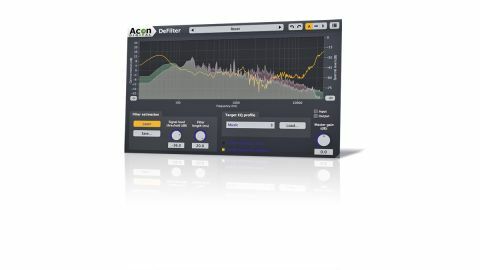 Acon Digital's DeFilter plugin (VST/AU/ AAX) analyses your material, be it a full mix, a vocal, a room recording or anything else, and assesses the tonal imbalances present in it, such as those caused by standing waves, comb filtering and instrument resonances. It then smooths out those anomalies using a mirrored counter-EQ curve. You can also analyse a reference track and apply its frequency profile to another - certainly impressive on paper! To use DeFilter, simply hit the Learn button and play all or some of your source material - preferably the loudest and busiest section - for between 15 and 30 seconds. The Signal Level Threshold knob is used to dial out the noise floor, which would interfere with the analysis process, and you can also adjust the Filter Length - the longer it is, the better the response, at the expense of CPU cycles. The resultant filter curve can have emphasis added to suit the material being processed. The Custom option, meanwhile, allows you to load a saved reference curve for EQ matching. An emphasis curve lets you narrow the area of filter correction to a specific frequency range, so you can keep certain areas unaffected. A number of analysis presets are included as starting points, including Auto-Equalise Speech, Auto-Equalise Music, Remove Comb Filter and Remove Resonance, and you can save your own. DeFilter's interface and layout are very clear and intuitive. The EQ/spectrum analyser display shows both the frequency profile of the incoming signal and the corrected output, as well as the active Filter Curve. Getting good results from DeFilter is, like many such matching EQs, a hit and miss affair. Correcting anomalies in speech proves more successful than fixing problems with music, but the result with either is often just... different - not necessarily 'better' or 'worse'. For example, correcting a speech recording made in a very roomy environment helped with intelligibility but did little to reduce the roomy sound; while applying DeFilter to a recording of a band made on a handheld digital recorder didn't improve it at all - in fact, it often hurt the sound, tending to make it thinner. Matching the saved EQ profiles of favourite songs fared a little better, but this would be more useable if you were able to manually shape the EQ profile to refine the filter process. However, the analysed Filter Curve was useful as a visual aid for identifying tonal peaks and troughs - information that can then be used to guide the manual application of EQ. DeFilter is easy to use and very well designed, and can genuinely enhance intelligibility on poor speech recordings by effectively smoothing out unwanted resonances. With musical material, though, it's often less effective, requiring much trial and error to get useable results, and even then, the subjective nature of EQ means it might just be 'different' rather than 'better'. For matching the frequency profiles of reference tracks, it does a reasonable job, and can help steer you in the right direction, but ultimately, for corrective EQ, it's still hard to beat a good pair of ears, knowledge of the processes involved and experience.